For many of us, caring for your child’s teeth seems to get more complicated. Receiving suitable advice from a children’s dentist in Melbourne will help clarify some of the issues. One of these is around fruit juice. It would seem reasonable to think that fruit juice would be a healthy drink alternative, at least compared to a soft drink, for example. Unfortunately, this is not always the case. There are many confusing aspects to understanding what exactly juice is. In supermarkets, you will find fruit juice drinks that will only contain a small percentage of fruit juice. In addition, these drinks will often contain sugar and added artificial flavours to enhance the taste. Even if you do then find one of the full juices it may contain added sugar as well. Before you grab one of those very convenient small juice boxes and hand it to your child, have a look at the ingredients first to make sure that it really is a juice. There may be some vitamins in the juice that could be beneficial, but unless it has been made from fresh juice and contains some of the pulp from the fruit, it will be more like sugar water with flavour. This will be essentially the same as giving them soft drink in terms of the amount of sugar and the potential for causing cavities. 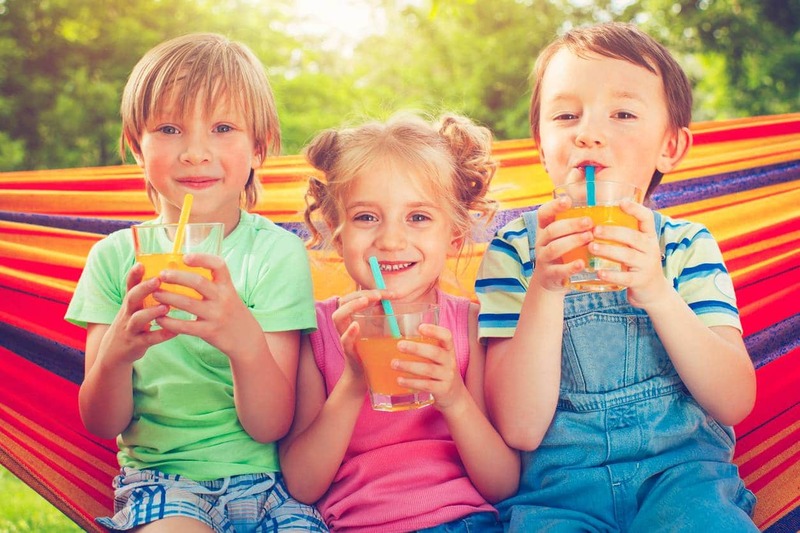 The American Academy of Paediatrics (AAP) has gone so far as to create a set of guidelines for what they consider the appropriate amount of juice for a child to drink. A very interesting recommendation is that no child under the age of one year should drink any juice at all. For children aged one to three, it is half a cup per day, for children aged four to six it is three-quarters of a cup, and for children seven or over it is up to one cup. It has also been suggested that juice should not be provided in sipping cups as this will expose the teeth of young children to an acidic drink potentially for hours. Drinking juice just before bedtime would also potentially cause problems with tooth decay. It seems then that the message is that juice should be considered to be a sweet treat. It should not be considered as a suitable replacement for fruit. Fruit juice is not good for developing teeth and it is not good for nutrition. There are considerations about the effect that consuming liquid calories has on satiety, as children are more likely to desire more calories even after consuming juice. In effect, in half a cup of juice, they are getting the same amount of sugar from say three apples, but still feeling hungry. Eating fruit will have a much different effect, and they will be getting the other parts of the fruits that are able to bring health benefits, such as vitamins, minerals, and anti-oxidants. Water and milk are healthier options for children. Whole fruits or vegetables also provide substantially more benefits and less sugar for children. Children’s teeth need regular checking to confirm there are no problems developing. Going to a specialised children’s dentist in Melbourne will ensure that they have the opportunity to become familiar with a dental clinic and also be given guidance in developing healthy oral hygiene habits. These are important to potentially reduce problems for them in the years to come. Contact Dentist Collingwood today by calling (03) 9417 6355 to book an appointment.